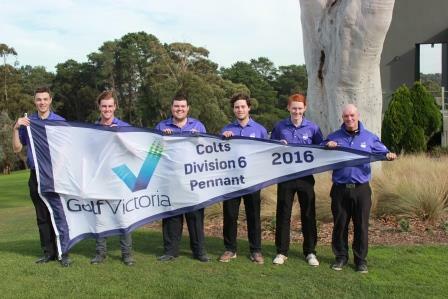 In 2016 Berwick Montuna GC made it's debut in the GolfVic Metropolitan Pennant Competition and came away with 2 successful teams. The Senior team defeated Bacchus Marsh in the final on Sunday 22nd May at Heidelberg GC and the Colts got over the line against Amstel/Settlers Run, also at Heidelberg GC. In addition to winning the flags, both sides qualified for promotion into Division 5 in 2017. JUNIOR TEAM WIN THE 2015 PENNANT!!! Team members pictured L-R : Ed Nicolette (Team Manager), Nick Steel, Dalton Crawford, Karnik Chand, Priya Chand, Matt Steel, Corey Wakeman, Bailey Clapton (Captain) & Tom Lidgerwood. For the 4th year running our Junior Pennant team have won the Pennant. An outstanding effort from an inexperienced team this year with 6 debutantes to Pennant competition play and only Captain Bailey Clapton and Tom Lidgerwood with previous years Pennant experience. This year was earmarked as a building year, but the juniors exceeded all expectaions by winning all bar one match and topped the table at the end of the season. The team should be congratulated not only on their win, but also in the way they represented the Club. JUNIOR TEAM WIN THE 2014 PENNANT!!! They have done it AGAIN!!!! That makes it 3 in a row for our Junior Pennant team. On a still morning the juniors headed down to Portsea to take on Mornington Golf Club in the Final. With revenge in their minds after being defeated in a close match during the season the team teed off in good spirits. It came down to our newest member of the squad in Callum Briffa. On the 20th hole Callum sunk a 25 foot putt to keep the match alive and finally on the 21st hole he calmly played the hole to perfection to secure the Pennant for BMGC. A final result of 3 matches to 2. Congratulations go to our squad for the way they performed and represented the Club. Team members pictured L-R : Wade McGill, Shane Sykes, Aaron Bowbanks, Mark Clydesdale, Ed Nicolette (Team Manager), Dean Baker, Brad McGill, Michael Reid, Eddie Nicolette. The boys went into the Final undefeated and chock full of confidence but weary of an opponent that gave them the toughest test during the regular season. The day started off cold wet and windy, as it so often does at The Dunes, and didn't really get any better from there. Wade McGill was the first player out to brave the conditions and unfortunately he didn't have a great day as his opponent proved far too good and never gave Wade a look in. Michael Reid was next finished, with much the same result as Wade's match. Not a great start as we were now 0 & 2 with a lot of work to do. Ed Nicolette provided the teams first win with a come from behind victory winning on the 17th 2 & 1. As has been Ed's way all season he just finds a way to win, I'm pretty sure he's forgotten how to lose, winning his last 4 holes to secure the match. Shane Sykes was next in with a comfortable 4 & 3 victory and the ledger was now squared at 2 all. Aaron Bowbanks finished up next with a 4 & 2 win and Berwick Montuna had hit the front 3 & 2, with only Mark Clydesdale and Dean Baker left out on the course. With Deano in a bit of trouble the teams fate rested with Mark's match which was all square with 2 holes to play. Cometh the hour, cometh the man as Mark calmly won the 17th and then the 18th holes to secure the match 2up and bring the Pennant home. Deano did fight back to get his match to the 18th eventually losing 1 down but with the result already decided, it was celebration time!! JUNIOR TEAM WIN THE 2013 PENNANT!!! 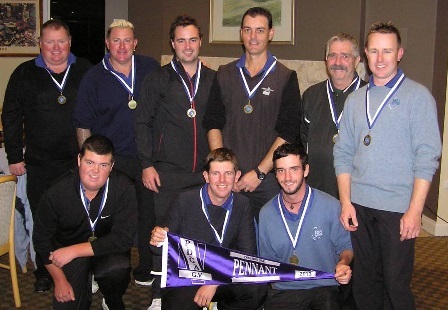 In a tightly fought home and away season our Junior Pennant squad has won the Pennant Flag. 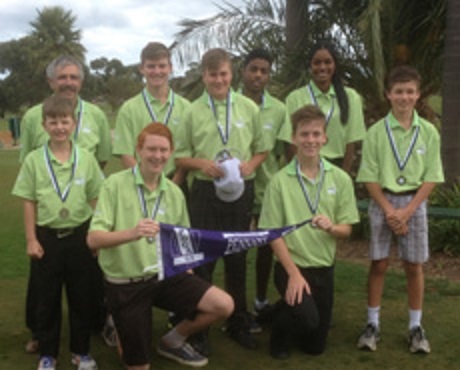 The final result was so tight that a tie could not be broken with Mornington Golf Club. Congratulations go to our squad for the way they performed and represented the Club. DIVISION 3 TEAM WIN THE 2012 PENNANT!!! Pictured L-R Theo Vassiliadis, Wade McGill, Craig Pockett, Taylor Westwick, Jack Touhy, Clinton Raven, Robert Young & Brad McGill Other Team Members included: Chris Webb, Ian Radford, Liam Crawford, David Chiswell, Greg Wicks & Andrew Clapton. The Division 3 team travelled to a cold and breazy St Andrew's Beach for the Final against the undefeated Mornington GC. Knowing that they had the advantage over Mornington, with a stronger team this time out, our boys were successful in defeating Mornington 4 1/2 - 2 1/2. Congratulations to the team for a Fantastic Season and Pennant win.